Measures the final application torque of screw caps and closures as they are being applied onto their containers. Portable and compact measures only 12 inches wide x 5 inches deep x 7-3/4 inches high. Torque is read on LCD digital screen in 1/10 increments. One piece stainless steel rugged enclosure suitable for mounting directly on top of Kaps-All Capper. Lexan panel for easy to use and cleaning. Display torque is held on screen for easy viewing until next test if performed. Model EM-980 monitors an application torque range from 0-100 lb-in and displays directly in lb-in, n-m, etc. Handles all styles, materials, types, shapes and sizes of closures, including child resistant and tamper evident. Audible and visual (LED) indicators to assist in ease of operation. Operates with 110V, 1 Phase, 60 HZ (50 HZ) or 220V, 1 Phase, 60 Hertz (50 Hertz). Certificate of traceability to the National Bureau of standards available upon request. 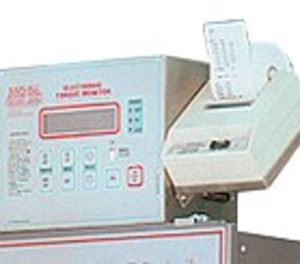 Built in mini-computer with standard statistical analysis packaging allows operator to display test results on integral screen without the need for additional complete and printers (printer comes standard with this unit). RS-232 communications link interfaces Torque tester to a computer or printer. Three indicator lights provided for a rapid visual aid to read test results. Unit constantly displays the bottles per minute (BPM) rate of the capper. -110v or 220V Electric (dependant on Machine to which it is attached).